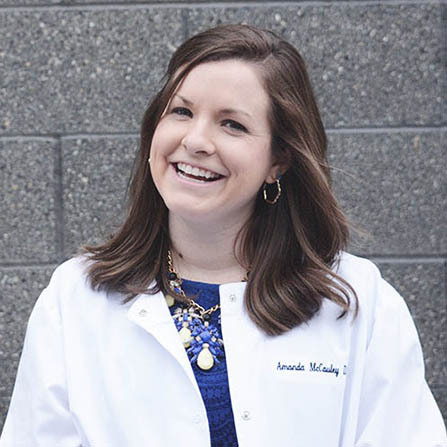 Dr. Amanda McCauley was raised in Richmond, Virginia and attended the University of Virginia where she graduated with a Bachelor’s degree in Chemistry. She moved back to Richmond to earn her dental degree from Virginia Commonwealth University and graduated in 2013. Dr. McCauley left Virginia after dental school to pursue advanced education in general dentistry in a one-year residency program at the Medical University of South Carolina. She moved to Seattle in July 2014 with her husband, Matt, where she worked as a dental associate before opening her own practice. She is a member of the American Dental Association, Washington State Dental Association, Seattle King County Dental Society, Academy of General Dentistry, and the American Academy of Cosmetic Dentistry. Dr. McCauley also enjoys sharing her technical expertise and enthusiasm for the dental industry with others. When the practice is closed on Wednesdays and Thursdays, you can find Dr. McCauley at the University of Washington’s Dental School working with junior and senior dental students to help them refine their skills and develop relationships with patients as part of the Restorative Faculty team. As new residents of the Pacific Northwest, Dr. Amanda McCauley and her husband Matt continue to explore everything that Seattle has to offer! In her free time she enjoys reading a good book, singing with Matt while he plays the guitar, baking, and kayaking! Dr. McCauley is very excited to bring her vision of a relaxing, comfortable dental practice to life and cannot wait to meet her new patients in Bothell.